Visiting professional groomers is a luxury. Although we love spoiling our canine friends and they do deserve certain indulgences, regular visits to professional grooming studios can be quite expensive. By grooming your dog at home you can increase the period between two professional grooming treatments. Or you can even skip going to salons and do everything yourself. 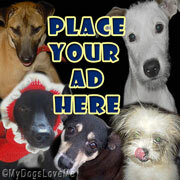 Remember that dogs of all breeds need regular grooming. The only difference between different breeds is the time that needs to spent on doing so – from once every few weeks to a few hours a week. To make things easier, we have compiled a list of 3 simple tips for DIY dog grooming. If you follow these simple steps, grooming your dog at home can be quite an easy process but it will still take a little bit of practice and patience. It is advisable to research your dog’s breed and its coat type in order to learn what to expect of the grooming session and which tools you will need. Different coat types require different tools. If you feel confused, it might be a good idea to schedule an appointment at a professional groomer for a one-time consultation. During the consultation, the professional groomer can teach you how to keep the grooming sessions short and pleasant. 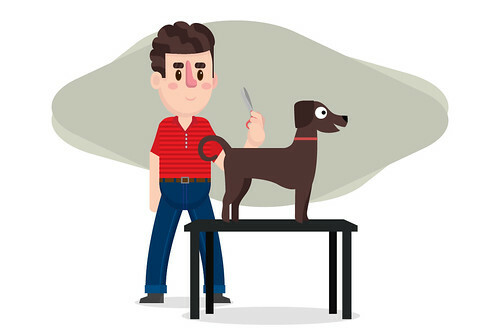 You can read every blog and article available online and even purchase the best grooming equipment available on the market, but if your dog does not want to be handled, the grooming session is doomed. To avoid such situations, train your dog to enjoy grooming during its puppyhood. 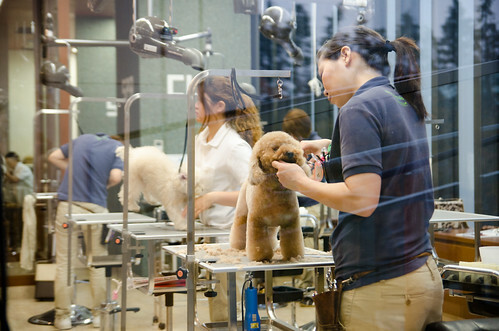 Use positive reinforcement techniques, like treats and praises, to associate the grooming session with positive experience. It is not advised to bath your dog without brushing it first. Brushing or combing, helps mechanically remove the dirt from your dog’s coat and it also unclogs tangled hairs. If you find a mat that cannot be untangled do not hesitate to cut it out. When brushing your dog at home, make sure to brush your entire dog. 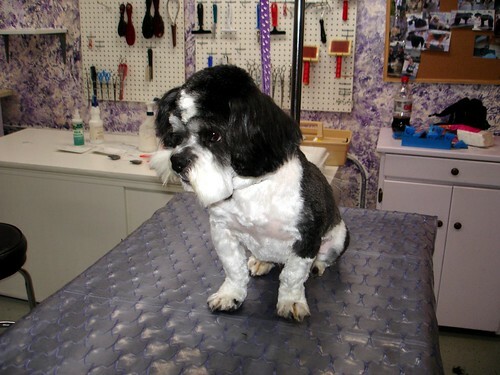 It is true that certain areas like faces, tails and legs can be trickier, but they need to be groomed too. Even in short haired breeds it is important to brush all areas, because brushing increases the blood circulation in the skin, thus promoting healthy skin, for growth and proper skin oil production. Once properly brushed, you can proceed to bathing your dog. Start by wetting the coat thoroughly all the way to the skin with lukewarm water. When the dog is wet enough, apply the shampoo and let it stay for a while. 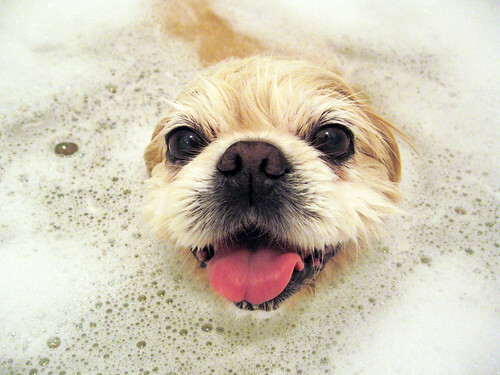 Then rinse your dog thoroughly and remove the excess water with towel. You can either leave your dog to dry naturally or you can use hair dryer. When bathing your dog, never forget to clean its eyes, ears and teeth and clip its nails. Since frequent bathing disrupts the natural balance of the microorganisms on your dog’s skin and leads to skin and coat issues, try to minimize the number of baths and bath your dog only when it is too dirty and before trimming its coat. The first rule to DIY dog grooming is to never use human clippers. Human clippers have only one length of blade and since that length is often too short for dogs, it can cause skin burns. Human clippers also produce much more heat and are less powerful when compared to dog clippers. If you plan on grooming your dog at home on a regular basis, it is of paramount importance to obtain a good dog clipper. High quality dog clippers cost around $100 and above, but at the end you get what you pay for. Dog clippers are an investment that pays off. It is important to remember that certain areas of your dog’s body are thinner and those areas should be clipped with extra care and caution. These areas include the face, eyes, ear flaps and edges, armpits, belly, underside of the neck, sanitary areas, toes and tendons on legs. Improper handling of these areas causes the skin to pull up quickly and catches into the grooming tools, thus causing bruising and cutting. The second most important tool is the scissors. There are many types of scissors and they all serve different purpose. For example thinning scissors are used for extremely thick coats that need to be thinned out; curved scissors are used to trim and shape the fur around the contour of the dog’s body; rounded tipped safety scissors are used for cutting the hairs in delicate areas. The straight scissors are the most universal tool and can be used on most coat types. Last but not least, think about getting a dog grooming table. Placing your dog on a table makes it easier to restrain it and it is also easier on your back. Chooey's Note: The pack would like to thank a Miss Jenny for this guest post contribution because Haopee is currently "preoccupied" and too busy to tend for the blog.